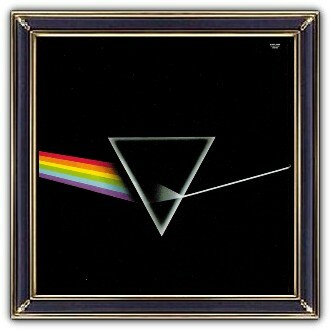 The cover art is produced by Hipgnosis with design by Storm Thorgerson and illustration by George Hardie. 'The idea itself was cunningly cobbled from a standard physics textbook, which illustrated light passing through a prism. Of significance was the simple, elegant layout against black – standard textbook illustrations did not do this. Also important to the art direction, was the fortuitous decision to listen to Rick Wright, who suggested we do something clean, elegant and graphic, not photographic – not a figurative picture. 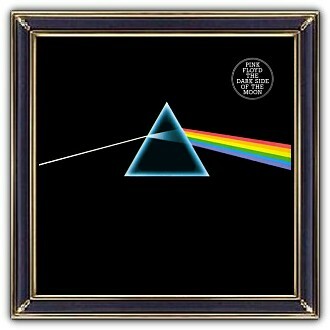 And then to connect this idea to their live show, which was famous for its lighting, and subsequently to connect this to ambition and madness, themes Roger was exploring in the lyrics … hence the prism, the triangle and the pyramids. The design is simply a mechanical tint lay, which means we drew outline shapes, black on white, and indicated what colours were to appear when printed. The prisms were airbrushed black on white and reversed by the printer. 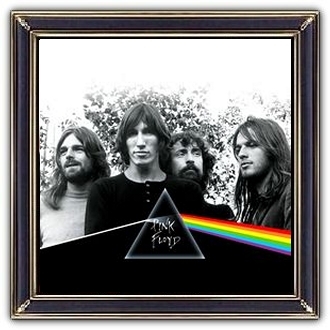 The refracting glass prism referred to Floyd's light shows – consummate use of light in the concert setting. Its outline is triangular and triangles are symbols of ambition, and are redolent of pyramids, both cosmic and mad in equal measure, all these ideas touching on themes in the lyrics. 'Pink Floyd, in their infinite wisdom, perused our 7 complex detailed roughs for this cover in a drab basement room at Abbey Road – submissions over which we at Hipgnosis had toiled for weeks – but managed to decide within 3 minutes which one they liked. No amount of cajoling would get them to consider any other contender, nor endure further explanation of the prism, or how exactly it might look. ‘That’s it’, they said in unison, ‘we’ve got to get back to real work’, and returned forthwith to the studio upstairs. To look back now and reflect upon how the actual artwork itself had no colour, being just a tint lay, and how the spectrum was missing a colour anyway, and how the whole design was only cobbled from a standard physics textbook diagram .... all of this just goes to show how such matters pale if a design feels ‘appropriate’. The joining of the spectrum extending round the front/back cover into the gatefold inside was seamless like the segueing tracks on the album, whilst the opening heartbeat was represented by a repeating blip in one of the colours.